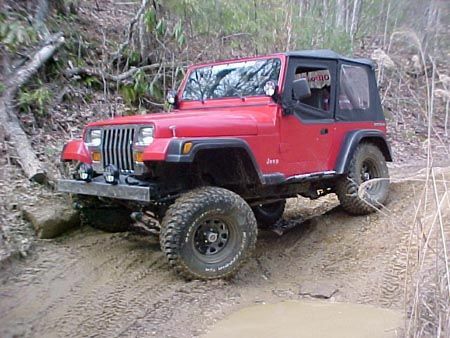 Previous Entry Jeep Thrills Wii ~ Are you Hooked? Hey, thanks for all that info on my plastic windows. I wonder why the dealer didn’t bother to tell me all of that. If it was in the handbook I never saw it. I’m going to start carrying a plastic jug with a mild soapy water so I can clean them as needed. I don’t mind the rest of the Jeep getting muddy, but I do like to see out of the windows at all times. I learned about plastic window care the hard way. I scratched them up pretty bad before someone told me to stop what I was doing. I don’t know if it was in the handbook because I didn’t read it. I only read the instructions if all else fails. Guess I better mend my ways. I really never gave it a thought. After a weekend off road I run it through the local car wash to get all of the mud and grime off of it. It doesn’t appear that it has hurt the windows any. It’s not the type with the brush, it’s just spray soap and water. If your dealer had been doing his job Greg, he would have told you how to clean the plastic windows. If we didn’t tell our customers just those types of things, we would be out looking for new jobs. I looked at a couple of used Jeeps and the plastic windows were so scratched up that you couldn’t see anything through them. I think they must have used a wire brush, or at the very least a bristle brush. I don’t particularly want to buy a new Jeep but by the time I replace the windows in a used Jeep, it probably won’t cost me much more.